Great little bag made from soft buckskin. The bag measures about 3 x 3¼ inches, not including fringe, and has a thong attached so that you can wear it around your neck or tie to your belt. 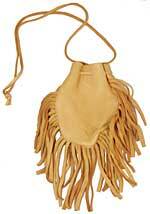 A very nice pouch made from soft buckskin. The bag measures about 4 x 5 inches, not including fringe, and has a thong attached for use as a drawstring. A nice size for attaching to your belt or can be worn around your neck. Great little bag made from soft buckskin. The bag measures about 2 x 2 inches, not including fringe, and has a thong attached so that you can wear it around your neck.